Here is wine made from pineapples, rather than grape wine with pineapple flavor. 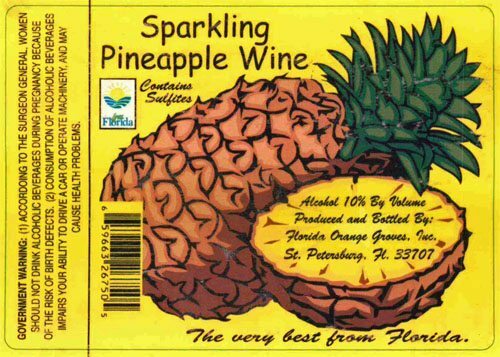 The above wine is produced and bottled by Florida Orange Groves of St. Petersburg, Florida. A second example is made in Thailand and imported by Radee Wine of Sacramento, California. On many labels, it can be difficult to draw the line. 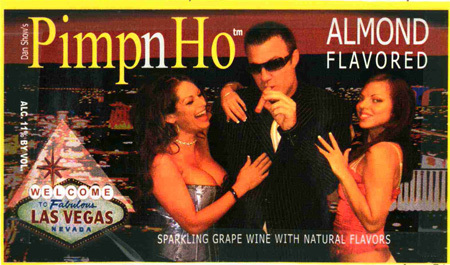 For example, it is tough to say whether this PimpnHo label (also by Weibel) goes too far. But then again, it is fairly clear that Champortini went quite a bit too far. 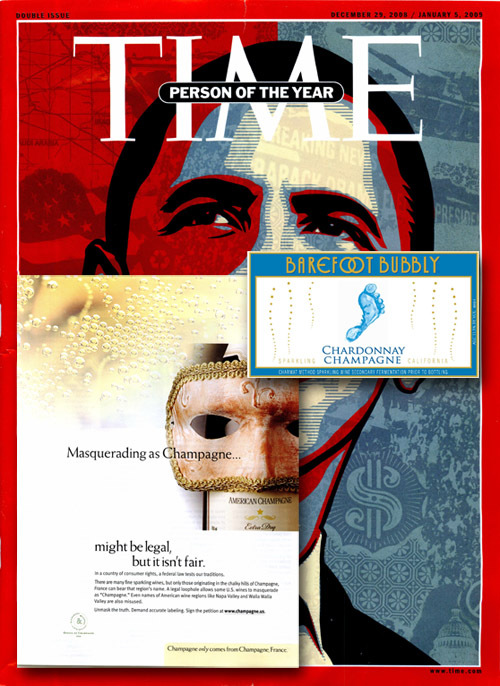 It suggests Champagne but does not qualify to be labeled as Champagne. It suggests Port but does not qualify as Port. It sounds a lot like martini, but has none of the traditional martini ingredients. This puts the brand out in some rough waters, without the safe harbor of an approval before the crucial 2006 grandfather date set forth here. Any one of these issues might have been enough to sink this brand, but putting all these issues together, it would be a great surprise if the brand did not sink. It apparently lasted from April 27, 2007 (the date of the first approval) until a little after February 20, 2008 (the date of the third and final approval, as above). 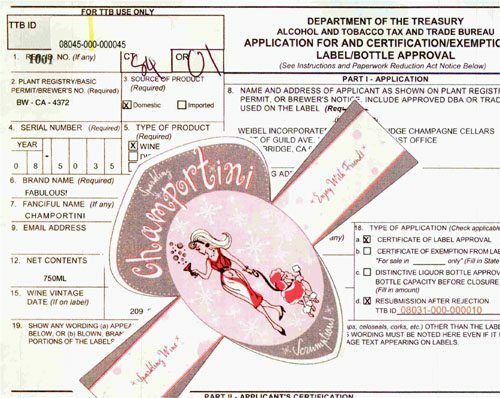 There is no trace of this brand’s survival at the Champortini website shown on the label. She goes running for the shelter of a mother’s little helper And it helps her on her way, gets her through her busy day “Things are different today” I hear every mother say. The song tells the tale of a “little yellow pill” that helps mom through her busy day. 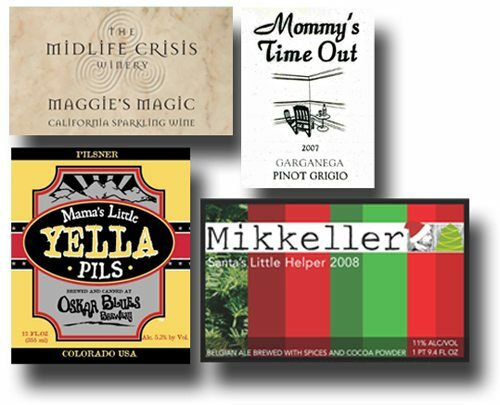 Along comes Oskar Blues Brewery with Mama’s Little Yella Pils beer. It’s not exactly what Keith Richards and Mick Jagger had in mind (Valium or Quaaludes, according to this). Even Santa needs some help from time to time. Plenty of labels with teasing, pimps and strippers. I will go out on a limb and commend the photo on the left. It’s about as “tasteful” and arty as a “strip tease” label should be, in our opinion. And, she’s not so skinny as the woman to her right. I am not so sure I’d go out on the same limb for the imagery on the right, but it’s undoubtedly a fine choice if you’re in the market for an almond flavored grape wine (and much classier than this one). Strip Tease is Argentina sparkling red wine. VIP Almond Sparkle is made by Weibel in California. Tags: risqué, sexual, would you approve it? For all those occasions when Cisco or Schlitz Malt Liquor is far too classy, may we heartily recommend this fine almond flavored wine? Even if this is not a big seller in the US, this page vaguely suggests that this winery makes a similar product for export.